Frankie’s Osu has remained one of the coolest places to hang out, chill and to eat at with friends and family. Frankies Restaurant has maintained a strong presence on Accra’s most famous Oxford Street and most visitors have a special they have fallen in love with. Frankie’s Chef is a well experienced and passionate chef. He has been in charge of the Frankie’s Kitchen over the last 15 years. He has such a passion for creating dishes and leading his team to a perfect delivery. With this much experience you can only be expectant of an amazing and unique meal. In his own words, he longs to create such wonderful dishes that people would fall in love with so much as to want to come back again for more. It is his belief as a Chef, that a taste of good cooking should whet your appetite enough to look forward to another experience. And this is the principle with which Frankie’s Chef runs the Frankie’s Kitchen and his kitchen staff so you will definitely not be disappointed. 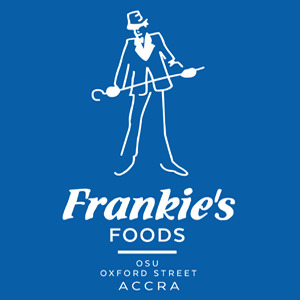 The Frankie’s restaurant is located in the heart of the Accra capital on the Oxford Street, Osu – Accra. The restaurant has it spacious car park as well as a kids menu cater for all the needs of children brought along to dine in Frankies. Being on Pizarea, customers are able to order for their favourite Frankies meal online and have it delivered to them in no time. They are able to make payment for their food online. However, relatives abroad can order for a delicious Frankies meal and have it delivered to their loves ones in Ghana, payment can be made via Worldremit. The location, environment and overall ambiance is essentially riped for the progressive 21st Century man/woman not afraid of experiencing the equally progressive and boisterous town of Osu hands on. We welcome you to this beautiful experience.